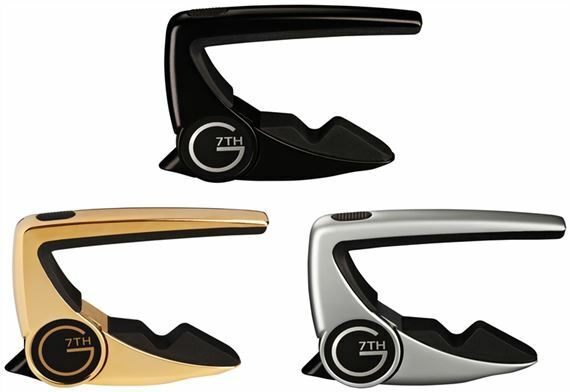 Order your G7th Performance 2 Guitar Capo from AMS and enjoy Fast & Free Shipping. Get the Best Deal with our Lowest Price Guarantee & Great Customer Service! Players love the way the Performance 2 capo kepts their guitar in tune. The Performance 2 is designed to be smaller and lighter than the original Performance capo, without compromising the tone. The Performance 2 gives you the ultimate capo experience. Not only has G7th made it slimmer and lighter, but they have also reversed it’s patented clutch mechanism, which gives it a lightning fast squeeze-on, squeeze-off action. It has also been designed to store behind the nut or on the peghead when not in use. It works as advertised. It's easy to use, easy to move around, and the guitar stays in tune. Simple to use and movement on the fret board is effortless. Not only does this capo look very professional but the ease of use is def a great plus as well. It is very easy to use and has a great feel and weight to it. Definitely recommending this to my guitarist friends. Awesome capo! i love this product! wow like a 3rd hand! This is a spectacular capo! This capo is the best I've ever used. Great capo. Small and non intrusive. Doesn't get in the way. Clamps on and off quickly and easily, and looks nice too. A little pricey compared to the other styles, but I like it still.